TouchOSC is a powerful app for the iPad or iPhone that lets you send and receive OSC messages over Wi-Fi to control audio applications. I’ve set it up with Reaper to create a custom control surface on an iPhone or iPad. Here, I’m going to show you the basics of getting TouchOSC up and running with Reaper. The next blog post will detail creating custom layouts and Reaper configs for TouchOSC. But first, the basics! 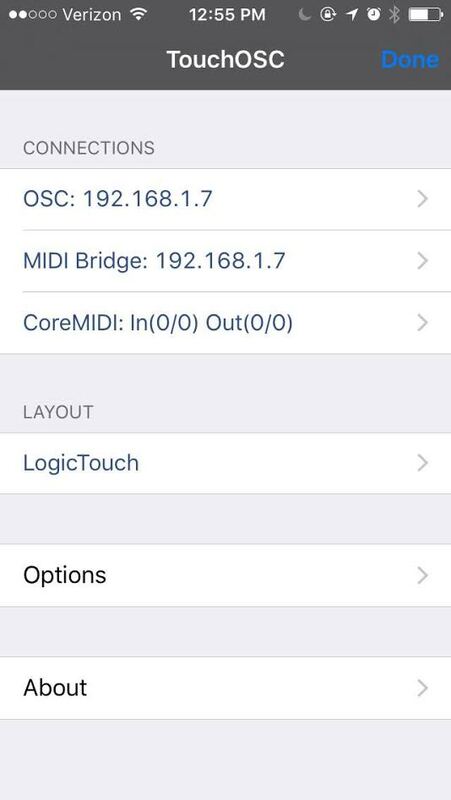 Note: For the entire system to work your iPhone or iPad has to be connected via Wi-Fi to the same network as your computer running your DAW. Go to the AppStore and download the app on your iPhone or iPad. These programs will run on your host machine running your DAW. The bridge application will receive the OSC messages from your device and the editor will allow you to create custom layouts. If you are running a 64 bit Windows installation, download the 32 bit TouchOSC Editor instead. Otherwise you are likely to get a Java Runtime Environment error. 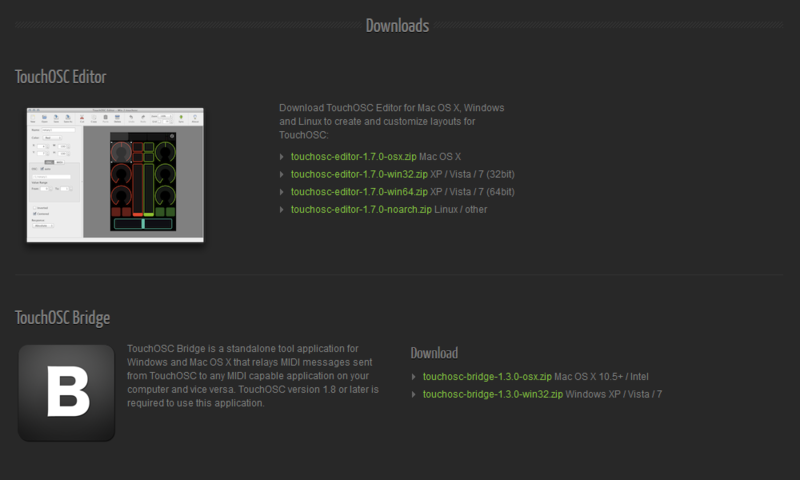 Now that you’ve installed the TouchOSCBridge application on your host machine, you need to connect the app and the bridge. Make sure TouchOSC Bridge is running on your host machine. In Windows, it shows up in System Tray. Launch TouchOSC on your phone or tablet. 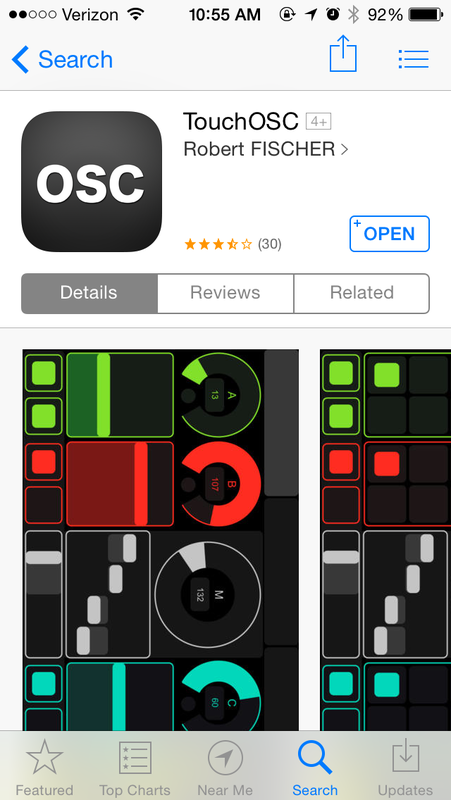 Click on OSC to configure your OSC setttings. In the Host field enter the Hostname or IP of your computer running the Bridge. Your Local IP address is your device’s IP address. You will need to enter that into Reaper next. Launch Reaper and go to Options->Preferences. Click on Control Surfaces on the left hand pane and Add a new Control Surface, selecting OSC as the type. Give your device a name in the ‘Device name’ field. 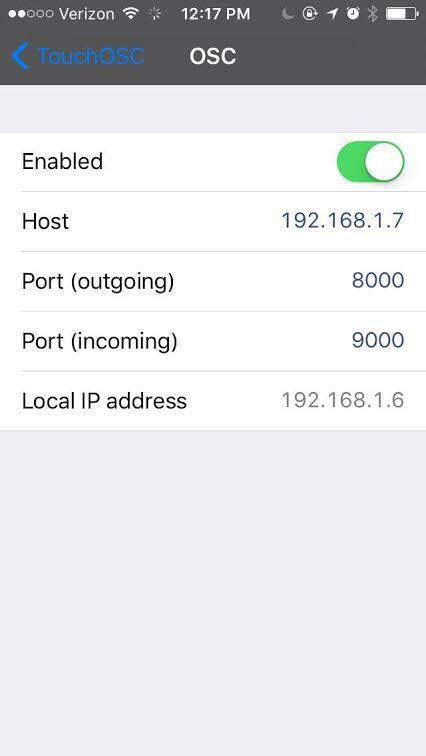 Enter your phone or tablet’s IP into the ‘Device IP’ field and make sure Receive on Port and Send to Port boxes are checked. 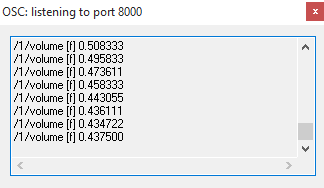 8000/9000 are the default ports, so unless you’ve changed them in the TouchOSC app, leave them at their default values. 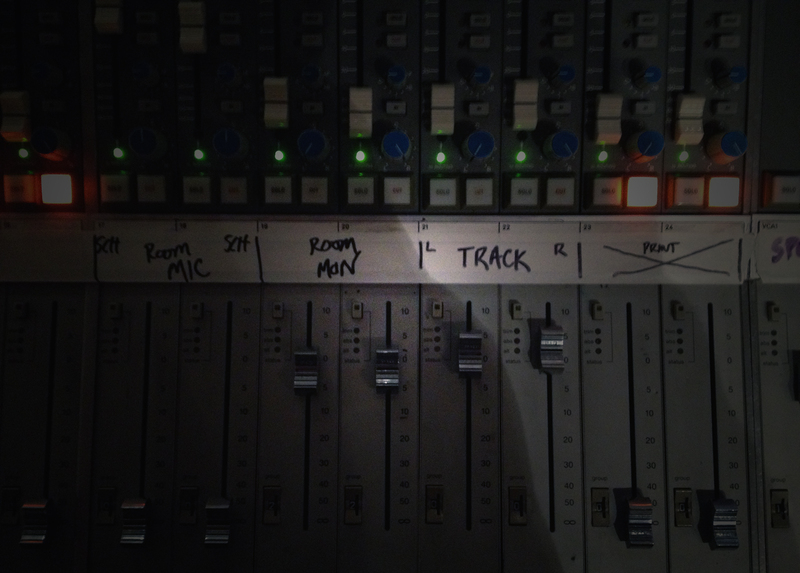 Hit the Listen… button and move any knob or fader in TouchOSC. If you have a connection you should see feedback. If you do not see any feedback, check that your IP addresses are set correctly and that any firewalls or router configurations are not blocking ports 8000 and 9000. Once you see OSC messages coming from your device you need to select a layout. Reaper comes pre-configured for the LogicTouch and LogicPad layouts. 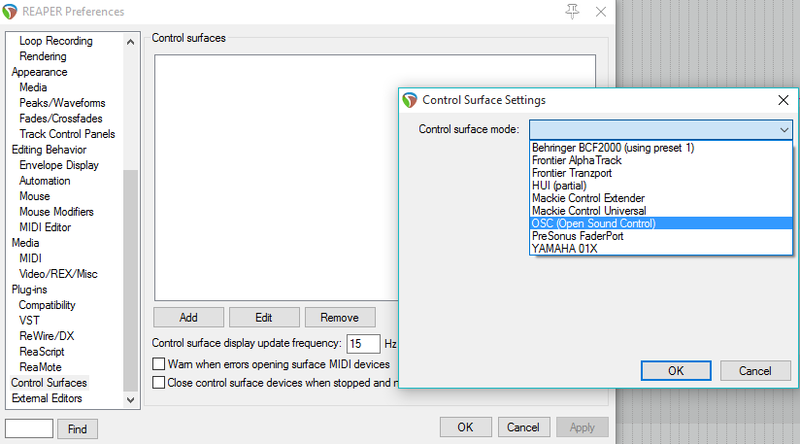 Make sure your layout matches the Pattern config selected in the Control Surface Settings menu. Voila! You are now controlling Reaper with OSC. The next blog post will detail how to create custom layouts and configs to do more powerful things in Reaper. Thank you very much – Your tutorial made the setup very easy for me! 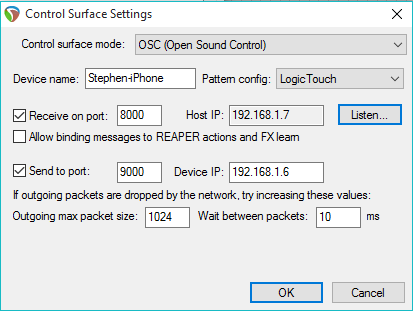 So do you need to have internet/WiFi to run the control surface with reaper etc ? just a quick note to say a HUGE thanks for sharing this. I struggled through an evening of frustration with trying to get this up and running. Figured I’d set it aside and chew away at it later – well, today was the ‘later’ and your article was the information I needed to get this up and running smoothly. I’m using an iPad over home WIFI and it works like a charm.